The utilization of refrigeration and cryogenics contributes to high-quality preservation and processing of foods, in environmental protection, and in case of emergencies. Refrigerating and cryogenic engineering enhance progress in machine-building and automation of manufacturing processes, while refrigeration and cryogenics are increasingly used in construction. Refrigerating engineering is the backbone of the air-conditioning industry. 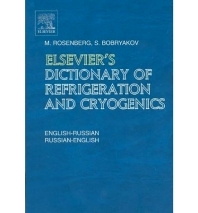 This dictionary covers all of these aspects: it presents terminology that is used in thermodynamics and transport, as well as terminology depicting the use of refrigeration and cryogenics in the chemical and mining industries and in low-temperature physics. It contains basic terminology on refrigerating machinery, heat-transfer processes and heat-exchange equipment, refrigerating plants, cold-storage warehouses, refrigerating commercial equipment, and units.